Fire Trucks, like police cars, must reach their destinations as quickly and safely as possible using any and all means available. In the USA, it is law that motorists pull to the right or left and stop as soon as they see the flashing lights coming their way. Sirens are the attention getters; lights show the specific location of the vehicle, both are crucial components in helping first responders reach the incident in the absolute shortest time. Firefighters do a whole lot more these days than just putting out fires and getting cats out of trees. They need focused light on a road surface to clean up hazardous wastes, on an accident scene to put out a fire, or on a specific part of a vehicle while their specialized cutters and spreaders open a passage to remove passengers from wreckage. They are trained to deal with additional situations like air-bag deployment and pending explosions Extreme Tactical Dynamics has many multi-functional warning lights that assist firefighters at the emergency by lighting up the scene once they arrive, and target a specific area so they can perform one of their many duties. Our firemen/women are trained in first aid and in the use of ventilators which they administer to victims if they arrive on the scene before EMS. So, they MUST have high-powered, dependable, long-lasting LEDs that use bright steady light to illuminate the disaster zone. Nothing is more important than LIGHT when at an incident occurs at night. First responders MUST have enough light to do the jobs they are so highly trained to do! ETD has those lights. Strobing lights are not only essential but mandatory on a vehicle the size of a fire truck speeding through the streets on its way to an emergency, and that’s exactly what ETD has! Every light we sell has up to 30 flash (strobing) patterns that can be wired to alternate or synchronize creating a complicated series of eye-blasting flashing lights that are highly visible over long distances. Our largest to smallest lights have strobe features, whether it’s for a visor, a head or tail light, for the surface, deck, and dash, or for the roof of any first-responder unit, ETD has exactly the strobe lights to make you highly visible so traffic will get out of your way! Fire trucks must be highly visible to oncoming motorists so every vehicle can get out of the way of these enormous machines. Mounting several full-size light bars around the perimeter of the double or triple size cab of these huge trucks, is a common light application for our long bar lights. Mount them on the back and sides as well for a full circle of light. Extreme Tactical Dynamics has several high wattage bars that are up to 48” long and an abundance of surface mount lights that will turn a truck into a flashing beacon of light. Red and white lights are used (with an occasional single blue fire light somewhere on the back) on fire engines and department trucks and SUV’s. Each state in the Union highly regulates not only light color but light placement on emergency vehicles. In addition, there are laws controlling the use of lights going and even returning from an emergency. Extreme Tactical Dynamics has compiled an up-to-date state by state list of regulations, in the Knowledge Base section of our site, governing the use, color, and placement of emergency lights. Most fire trucks come totally outfitted with lights that meet standard regulations; just be sure to check out your state’s regulations before adding any more or before outfitting your POV or MFV if you are a volunteer firefighter. A little history might interest you. Benjamin Franklin in 1737 organized the first fire company. Prior to that the law required that any fire in home or on hearth must have a bucket of water at hand in case of an emergency that was it; firefighters were only unorganized bucket brigades. In 1905, it was Popular Mechanics, the same magazine we have today, that advocated the use of motorized ‘fire’ engines instead of horse drawn wagons. 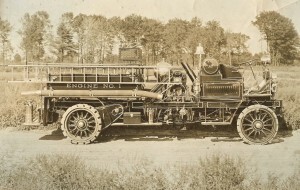 Knox Automobile Company in Springfield, Massachusetts built the first fully equipped fire truck in 1906, which included ladders, lights, sirens, etc. Firemen stood on the running boards, holding on for dear life as trucks weaved passed horse-drawn buggies, pedestrians, and the chaos on the streets. Extreme Tactical Dynamics has just the right emergency light to enhance a vehicle, whether it’s your own, assigned to you, or part of a police or fire department fleet. From tiny, powerful 3-watt strobes that can be hidden on reflectors, to massive 48” roof lights with numerous features and options and a 360° light spread, we have a wide range of high-performance, quality lights are rock-bottom prices. One fire department updated an old fire engine by adding the 48” Full Size Light Bar with Linear 1 Optics, making it a high-performance addition to the fleet once again!